At 12h02, Friday, 08th June, NSRI Port Elizabeth duty crew were activated by the Transnet National Ports Authority (TNPA) following a request for assistance, made through the Nelson Mandela Bay Water Safety Committee, for NSRI to assist EC Government Health EMS and the SA Police Services who were in attendance on the bulk carrier MI Harmony, docked in the Port of Port Elizabeth at Berth 9, where a male, believed to be aged 32, believed to be from Tanzania, had been discovered on the ship as a suspected stow away. The man had reportedly fled from the ships crew after being discovered and he had suffered a fractured left leg (compound fracture of the Tibula and Fibula) while fleeing up a crane on the ship before reaching a narrow ledge half way up the crane. Ships crew were able to reach the man and he had been secured by ships crew, using harnesses, but they were in a barely accessible part of the ships crane above the deck of the ship and EMS and Police responded to assist. Our NSRI duty crew responded and on arrival on the scene the patient was being medically attended to by an EMS rescue paramedic on the narrow barely accessible shelf on the crane. The patient and the EMS rescue paramedic were on a barely accessible shelf half way up the ships crane. It appears that the patient had climbed up the crane to flee from ships crew after being discovered, fractured his leg, and he had reportedly threatened to jump from the crane but the ships crew had managed to reach him and secure him while an EMS rescue squad and were responding to the scene. A Police Dive Unit were also in attendance together with TNPA authorities. 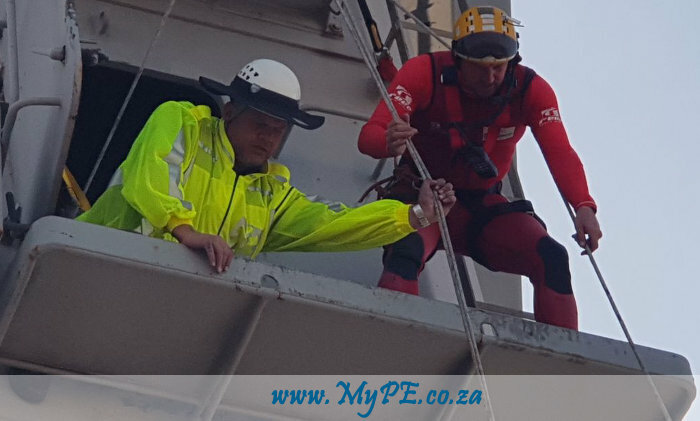 An NSRI rescue technician, using high angle technical rescue equipment, joined the EMS paramedic and the patient on the narrow shelf on the crane. The fractured leg was securely splinted and using a Paraguard stretcher and high angle extrication equipment the patient was secured into the Paraguard Stretcher and he was hoisted onto the deck below and into the care of EMS paramedics and Police on the ships deck. The patient has been transported to hospital by an EMS ambulance for further treatment and he is in a stable condition. It is suspected that the man stowed away on the ship in Tanzania and although the ships last Port of call was Madagascar he was only discovered onboard once docked in the Port of Port Elizabeth.